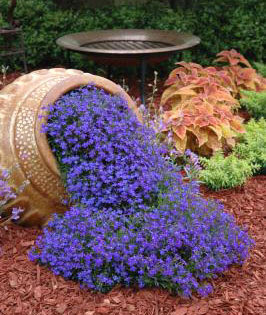 Lobelia is one of the true backbones of summer bedding arrangements. Suitable for hanging baskets, containers, as well as island bed schemes, it will flower it's heart out as soon as the spring frosts are over and will continue to do so right up until the first ground frost of winter. Take care though, get taken in by an early bit of sun and you could end up losing your lobelia to a late ground frost. Not only is this disheartening, it can also end up being a costly mistake! However, all is not lost as lobelia plants are easily grow from seed, so another batch of lobelia seed waiting to germinate in the greenhouse could save the day! So long as you can provide adequate frost protection over winter you can sow lobelia seed any time from late winter to mid spring. Using either a seed tray or modular plug tray, fill with a good quality compost such as John Innes 'Seed and Potting' compost. Sow the lobelia seed on the compost surface and gently firm down. Place the seed tray in a heated propagator at a temperature of 18-24C (65-75F). If you do not have a propagator then cover the tray with a clear sheet of glass or plastic or just seal it inside a polythene bag. Place the tray in a bright, warm position such as a windowsill, but keep it out of direct sunlight. Keep the soil damp but not wet, and do not exclude light as this aids germination which usually takes 14-21 days. As soon as the first lot of seedlings show through, remove any cover that may be in place in order to reduce the risk of fungal infections. Water as required, and once lobelia plants are 1-2 inches tall they are ready to be planted outside as soon as the risk of late frosts are over. Be aware that as the young seedlings have been grown under protection the foliage will be very soft and at risk of damage from wind and direct sunlight. With that in mind they will need to be hardened off a week or so before planting outside into their final position. Transplant outdoors in full sun or semi-shade on moist, fertile, well drained soil at a distance of 10cm (4”) apart.